NOTE: Apparently my version no longer works for Coda > 2.0.2. Try the newer versions made available by Matthew and deryckoe. Thanks guys! If you’ve updated to Coda 2 and have been using the excellent WordPress Syntax Mode by Thorsten, you need to copy it (and any other modes you’ve been using) over to ~/Library/Application Support/Coda 2/Modes/. It works just fine, but syntax highlighting is broken. 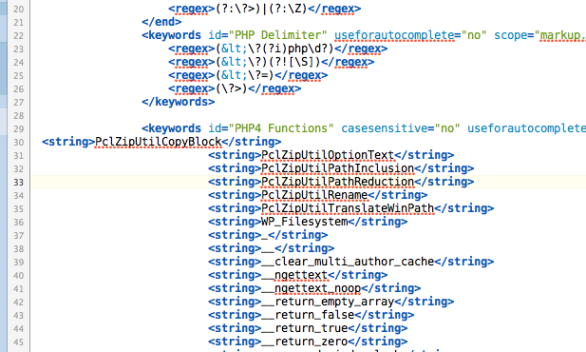 To fix this (and avoid wading through too much code), I simply made a copy of the SyntaxDefinition.xml file in /Applications/Coda 2.app/Contents/Resources/PHP-HTML.mode/Contents/Resources/ and copied over the contents of the <keywords id="PHP4 Functions"> ... </keywords> node from Thorsten’s version. Finally replace all instances of PHP-HTML in the file with PHP-HTML-WP, save the file as SyntaxDefinition.xml in ~/Library/Application Support/Coda 2/Modes/PHP-HTML-WP.mode/Contents/Resources (replacing the old one) and restart Coda 2. For convenience, here’s the whole updated mode package: PHP-HTML-WP.mode. Unzip and drop into ~/Library/Application Support/Coda 2/Modes/. NB: This is just a quick hack until Thorsten updates the original. I cannot guarantee this will work perfectly for everyone. Thanks You so much !!!! Thanks! Just was reading an article about the plugin being broken on Amber Weinberg’s site. I just switched to Coda v2 (from DW) yesterday – and I would so love to get the WP syntax into coda BUT … There is no folder under my application support called Coda – and naturally adding it, does not hep. Could anyone be so kind to tell me how I do this? Thanks for this a nice little short term fix! Oh shh.. I’m still on 2.0.1 (MAS version). Has anyone else the same issue ? I won’t upgrade if so.. Yes, with Coda 2.0.2 PHP-HTML-WP does not work fine. Any solution? Does anyone know if this would work with Coda 2.0.7? Nevermind. This is an earlier version of the same thing, its seems. sorry. Thanks for the comments guys! Since I haven’t been actively using Coda 2 for a while, I’ve updated the post to point to the new versions by Matthew and Deryck. Curious to hear what you use instead of Coda, and maybe why? A lot of developers are using Sublime Text 2 and it’s a good one but I don’t like the look and feel of the App. That’s the truth, at least for me. I feel very “unfinished” in this aspect. Panic Coda 2 have some performance issues but I think it’s one of the best right now.